*Cruise itinerary varies **Includes extra 2 nights in Sydney to enjoy the New Years Eve celebrations! "A quoi bon le compter, il ne s'arrêtera jamais" (Why measure time, it will never end). 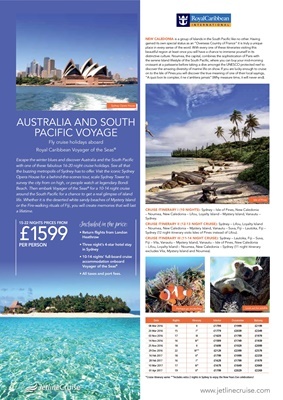 Sydney (12 night itinerary visits Isles of Pines instead of Lifou). excludes Vila, Mystery Island and Noumea).